Johns Hopkins welcomed alumni back with a win against Michigan, 16-8, and they were treated the crowd to their first entrance to the Big Ten Tournament. The Jays took control of the game in the second half and Michigan could not keep pace. With the win, Hopkins is guaranteed admittance to the conference tournament following their annual game against Maryland. Hopkins and Michigan traded goals in the first quarter, ending tied at three. Redshirt senior Phil Castronova scored this first goal of the season to give the home team the opening tally. David Joseph would score for Michigan to even the contest just over a minute later. Hopkins would take an early two-goal lead when John Crawley and Pat Frazer would able to score back-to-back. 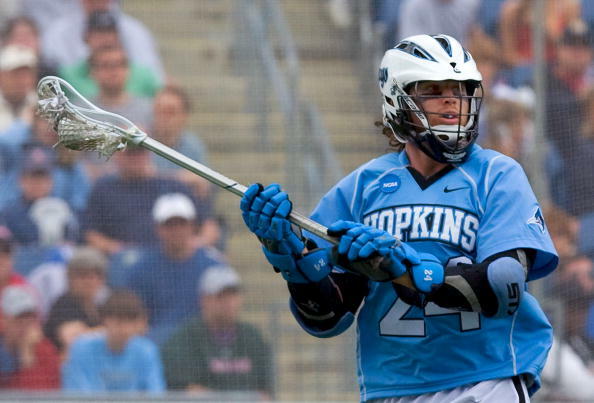 Frazer has been a dangerous component to the Hopkins extra man offense. Michigan would be able to answer to close the quarter tied at three. The second quarter would again be even, until six minutes remaining in the half when Hopkins was able to begin to pull away. Wells Stanwick scored, assisted by his brother Shack, and Michael Pellegrino scored, assisted by Castronova, to give the Jays a two-goal lead. Michigan would answer with two of their own to tie the game at five. First, David McCormack would score an unassisted tally to get within one. McCormack would assist the second in their run to tie, finding Mike Francia for the goal. Hopkins would score the last three to take a commanding lead into halftime. Shack Stanwick scored on an extra man opportunity, assisted by Crawley, to reclaim a lead they would never relinquish. Midfielder Connor Reed would have a hand in the last two before half. First he scored an unassisted tally for a two-goal cushion and then he assisted Holden Cattoni’s goal to give the Jays an 8-5 lead going into half. Hopkins would open up the second half with the first two goals to give them a five-goal lead early. Wells Stanwick scored, the assist credited to Joe Carlini. Wells Stanwick then found Cattoni for his second of the game. Hopkins had a five-goal run starting back to the second quarter until Michigan finally stopped the Jays at the 7:15 mark of the quarter. Michigan’s Kyle Jackson was able to beat Hopkins goalie Eric Schneider to end the Jays run. Ryan Brown would answer two minutes later with an unassisted marker to again stretch the lead to five. Michigan would score the next two goals to get within three before the end of the third quarter, but Hopkins would take control of fourth quarter. Ryan Brown scored to end the third quarter scoring and linemate Wells Stanwick would start the scoring in the fourth. Johns Hopkins would score the only goals in the quarter. Crawley would score his second of the game with 7:31 left in the contest. Freshman Joel Tinney would score on a hidden ball trick, leaving Michigan’s defense confused on who had possession. Tinney would score the final goal of the contest in close, beating Michigan’s goalie Gerald Logan, who was then substituted out Robbie Zonino. With the win, Hopkins next contest is against rival Maryland. Maryland will look to go undefeated in the Big Ten regular season and earn the number 1 seed in the conference tournament. Hopkins played three goalies, with Schneider being the most successful with five saves in the contest. Offensively they were led by Wells Stanwick’s hat trick, finishing with four points.